I took some photos of the kids while we were walking the dogs last week. They kept stopping at trees and whispering ‘Hello’ to check if anyone lived inside. So the ‘Enchanted Forest’ kit was perfect for a scrapbook layout. I cut a rough cloud shape out of some scrap paper and used blue ink over it to make a cloudy sky background. 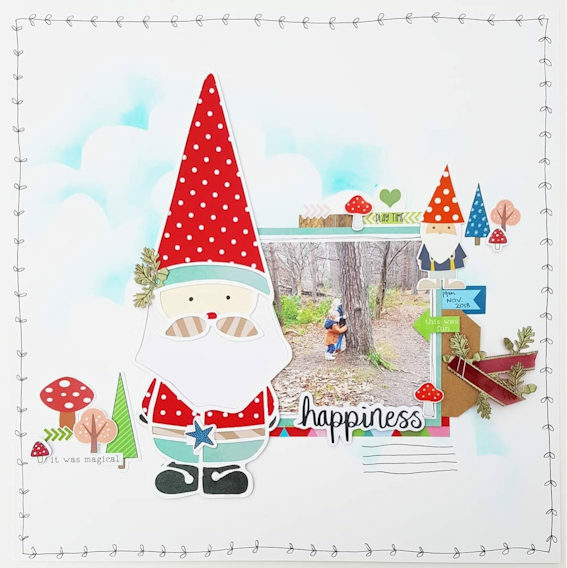 I found the cutest free gnome cut file from Paper Issues and thought it went perfectly with the kit. I backed it with some of the papers and although I think he looks more like Santa than and gnome he’s still fun! I cut some of the leaves from the ribbon and added a couple of them to his hat. The tag that held the paper clip, I trimmed the top off and put some of the ribbon on the top. I slid it behind the photo and added a couple of the die cuts and stickers just above it. There were a few spaces I wanted to fill at the side so added some of the tree and toadstool stickers. I used the large ‘Happiness’ die cut as a title and added a few lines for journalling underneath. I doodled a little leaf border around the edge to finish it off. I hope you’re all feeling ‘Enchanted’ with your kits too! There are a few of these kits still left here.